The world is at war. Ebola is the enemy. Not Islamic State. Not Russia, Israel, Palestine, the United States, or any other nation or peoples you would like to insert here. No country—pardon the word choice—is immune to Ebola. The disease doesn’t care about cultural, political, racial, or religious differences that divide people. The disease indiscriminately attacks everyone. Ebola should unite us—a global community rallying against a common enemy. But the disease can, already does, divide us. Fear, not infection, is Ebola’s great weapon of mass destruction. In parts of West Africa, farmers abandon crops for fear of infection; yesterday, I heard a BBC radio report claiming as many as 40 percent of farms in some countries. Fear. Fear of infection will divide us unless we unite first. Fear is a contagion that can only be defeated by combating Ebola, starting in West Africa, where the World Health Organization predicts as many as 10,000 new cases a week. With a 70 percent death rate, there is reason to be afraid. The United States and Barrack Obama should lead the world to safety. Now is the time to use our tremendous arsenal of weapons of war for peace. The USA has the largest unmanned drone fleet in the world—the pejorative being unmanned. 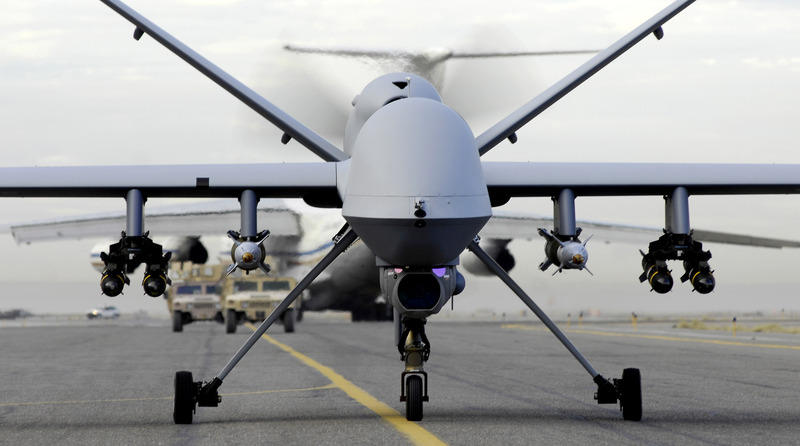 It’s a dirty word, for many people, as they see drones deliver bombs or spy on Americans. But against Ebola, drones can save lives rather than take them. Where men and women fear to go, drones can reach, without fear of infection. Every day, I hear or read news reports about drone strikes against Islamic State in Syria. I won’t debate the political motivations but highlight their intent: To combat fear. Fear that terrorists will gain control over vital resources or peoples that affect us—Americans and our allies. But Ebola is the greater fearmonger, with resources to destabilize the fragile—yes, fragile—global economy. Already, in West Africa, World Bank predicts that Ebola’s economic toll could exceed $30 billion. This year! What happens should global trade slow or stop because of Ebola fear? The world tears apart. If the United States can use drones to fight fear in Syria, surely we can turn them to assault a larger fear enemy on the African continent. I want to hear news reports about drone strikes against Ebola. I want to hear speeches from President Obama declaring war on Ebola. Unmanned drones are first-strike weapons. Amazon talks about using drones to deliver purchases to Americans; surely the United States can use them to bring protective medical gear to hospitals in countries like Liberia or Sierra Leone. Closed borders to commercial air traffic are no barriers to drones. Other medical supplies are important, if not more, such as anti-malarial drugs. Malaria is the greater killer in Ebola regions, but fear prevents treatment. People dying of malaria, or diarrhea, are tragic collateral victims of Ebola’s fear campaign. Drone drug deliveries could save lives! Drones also can bring hope and, say, by pamphlets deliver valuable information to West Africans—or to anyone living anywhere where fear of infection, if not actual contagion, spreads. Knowledge can combat disease and the fear that precedes it. People need to know how to protect themselves, how to discern the signs of sickness (and differences from other scourges like malaria), and how to treat the stricken or safely dispose of the dead. Ebola’s surging spread should signal something to Americans. The disease is perhaps more communicable than health and government organizations seeking to quell fear would have us believe. Consider our own circumstance. One infected Liberian man spread Ebola to two health care workers in Texas, perhaps more. If U.S. hospitals can’t contain Ebola, why should we expect any better in countries with large rural populations or congested cities with few health-care facilities? But that one American hospital couldn’t protect health-care givers is a warning. It’s the canary in the coal mine that no one should ignore. At the peak of illness, an Ebola patient can have 10 billion viral particles in one-fifth of a teaspoon of blood. That compares with 50,000 to 100,000 particles in an untreated H.I.V. patient, and five million to 20 million in someone with untreated hepatitis C.
From another perspective, Ebola is highly contagious, and all efforts must be made to combat it. This is World War III, and the enemy is microscope and deadlier than any nation-state every created by man. But we should be more, ah, afraid of fear. Fear makes your neighbor an enemy, or your grocer, doctor—hell, everyone. When countries’ borders are closed, which already is the case in parts of West Africa, fear stops commerce and devastates economies. The world at war becomes one of untold societal and national upheaval, as fear—not just disease—advances like an invading army. What happens if residents start fleeing Texas, for fear of Ebola? That’s not a crazy concept, because fear is by every definition irrational. What happens when because of fear countries close their borders to shipping? Or travel? Or trade? Economic devastation brought on by fear can hurt or kill more people than disease. I encourage President Obama to declare war on Ebola. He received the Nobel Peace Prize early in his presidency, before demonstrating that he was good at anything more than rhetoric. Now the President has great opportunity to earn the Nobel, and to capture his place in history as the great humanitarian—to show Americans and the rest of the world why our nation’s first black president is more than historic for his race; history chose him to defend that which unites everyone regardless of skin color, culture, or religious beliefs. The right to live! The war on Ebola is really a war on fear, which defeat starts with leadership. Let there be an immediate G20 summit—100 is better—with America making the first and largest commitments to stopping spread of disease and fear. Fear can divide us, or we can unit to defeat it. But if we do nothing, the economic and societal devastation could make nuclear winter look like a summer picnic. While unmanned drones are first-strike weapons, there are others. Ebola survivors are the front-line soldiers. They can go where others fear, because of immunity. In the not-so-distant future they who lived will be every country’s greatest asset, starting in areas where Ebola ravages today. This pandemic could be the United States of America’s finest hour, or its worst. The disease is here. On our shores. The time to do nothing is passed. We owe a debt to every African slave brought to this continent, by, at the least, assisting the descendants their ancestors left behind. Ebola is no longer an African problem, but we can make it an African-American solution. Who better to rally the humanitarian effort than Barrack Obama—the president promising peace, unity, and change.